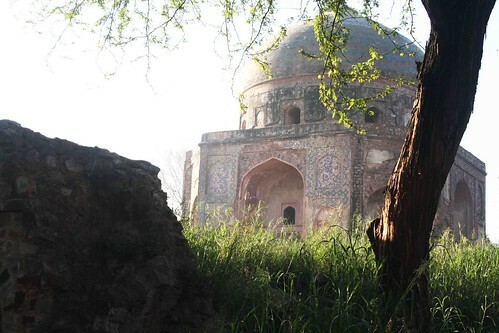 Its beauty lies in its tiled dome, rare in Delhi. 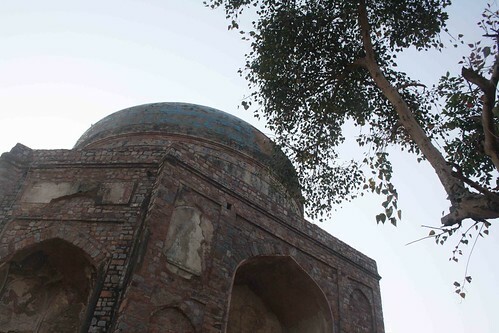 Situated behind Humayun’s Tomb, Nila Gumbad, or blue dome, was on the banks of Yamuna, the course of which shifted down the centuries. Now it faces the platform number one of Hazrat Nizmauddin Railway Station. 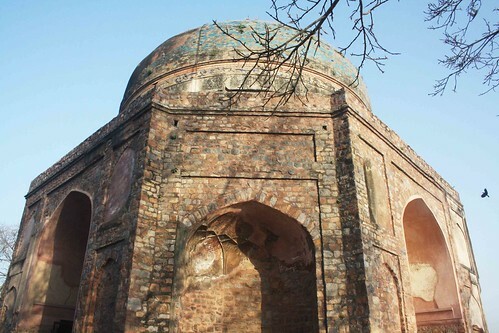 Built in 1625 by Abdur Rahim Khan-i-Khana, a noble in Akbar’s court, the Gumbad is Delhi’s oldest Mughal-era ruin. 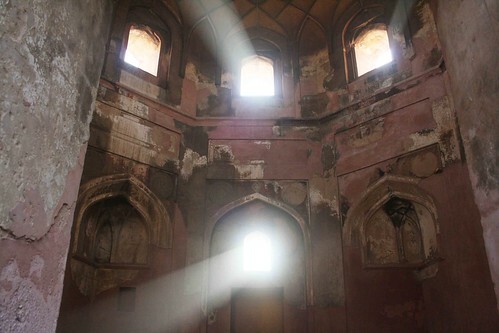 Though it is the tomb of Khan-i-Khana’s attendant Fahim Khan, The Delhi Walla saw no grave inside. A single-structure monument, the visitor has to concentrate only on a few essentials. The building – standing on a 32.9 sq. m platform – is shaped like an octagon from outside and is a square within. The dome retains most of its original blue tiles. 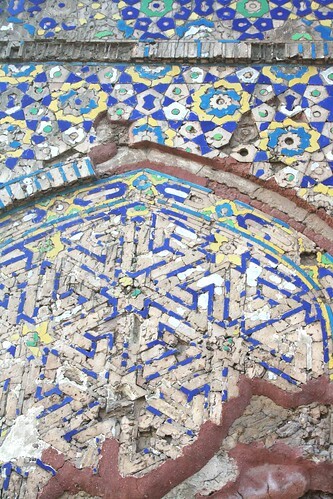 The wall facing the south too has hold on to most of its blue, green and yellow tiles. You don’t find such a dazzling display of colors in any other monument in the city. 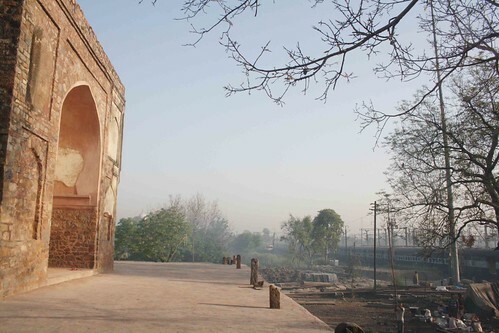 The tomb’s all four sides have recessed arches enclosing a doorway. The frills are few: Leaves of a peepal tree lie on the stone floor. Shrubs grow on the dome. The walls of rubble masonry show signs of cracks. The chamber remains locked by a grilled door. 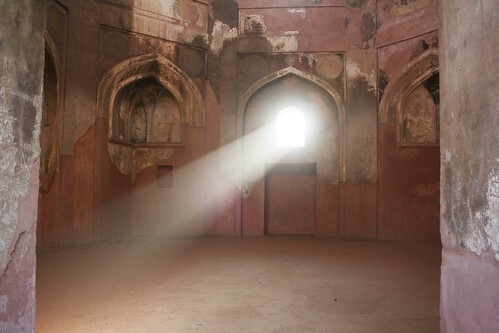 In morning, shafts of sunshine enter the dark chamber through its arched windows. Some beams fall on the floor, some on the roof. The effect is mystical. Interestingly, this structure is called “Subz Burj”. 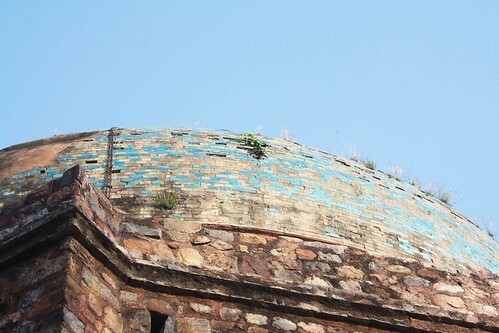 They say the blue tiles were green till (may be on account of deposits of dust) ASI restored them to the current state. Perhaps you are confusing Nila Gumbad with Subz Burz on Mathura Road.